This 225-acre ecologically diverse conservation area contains over a mile and a half of significant Androscoggin River frontage. A variety of habitats are found here including floodplain forest, stands of spruce on steep slopes and large white pine. Also on the property are old cellar holes lined with large stone blocks, attesting to former habitation in days gone by. Previously partially conserved through a long-term conservation lease with Verso Paper, ALT purchased this and other properties in October 2014 as part of our Androscoggin Greenway Community Forest Project with generous funding from Land for Maine’s Future and numerous private foundations. We manage the lands for wildlife habitat while practicing sustainable forestry. 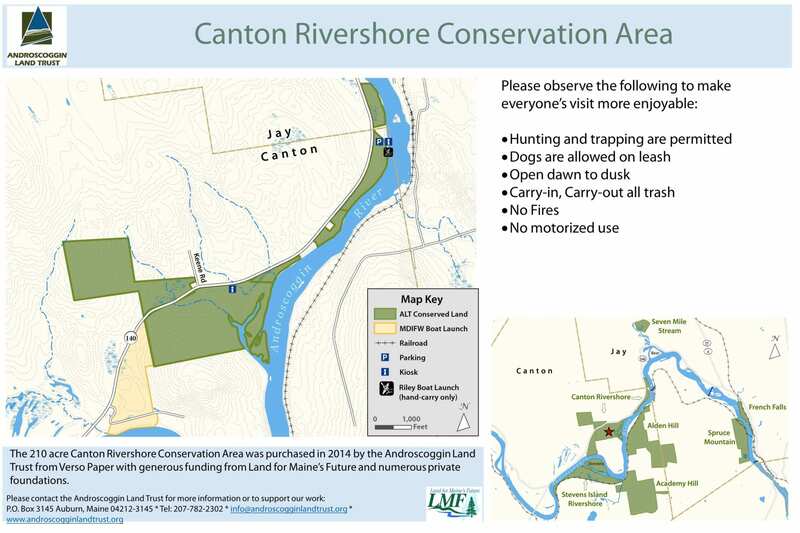 Directions: The Canton Rivershore Conservation Area is accessed via State Route 140. There is currently no official parking lot or access point to the conservation area, however there is sufficient room along the edge of State Route 140. Additionally, there is turnaround for a former picnic area along State Route 140, which can be used by vehicles with ample clearance.